“People come into our shop with coins that have been slabbed by a self slabber and the buyer paid huge money for them. The looks on their faces when I tell them the truth about there coins is very disheartening, and some get very upset and angry. “Just about six weeks ago a gentleman came in with three coins. A 1878 S & 1884 O Morgan dollar in [bottom-tier slabs]. All three graded as MS67. The holders look great with certification numbers a barcode and the whole works. He told me that he paid in total over $8,000 for the coins and had a receipt for them from about 2 years ago from what appeared to be a legitimate coin company. He wanted to know for sure so he asked us to send them to NGC for him. “So with him still present, we photographed the coins, filled out the grading service papers and sent them off. We received them back last week. The 1878 S graded ‘Unc Details, Improperly cleaned,’ 1884 O graded “MS 63,” and the 1885 graded “MS64. So in all there might be $200 worth of coins a total loss of around $7,800 + the grading fees. 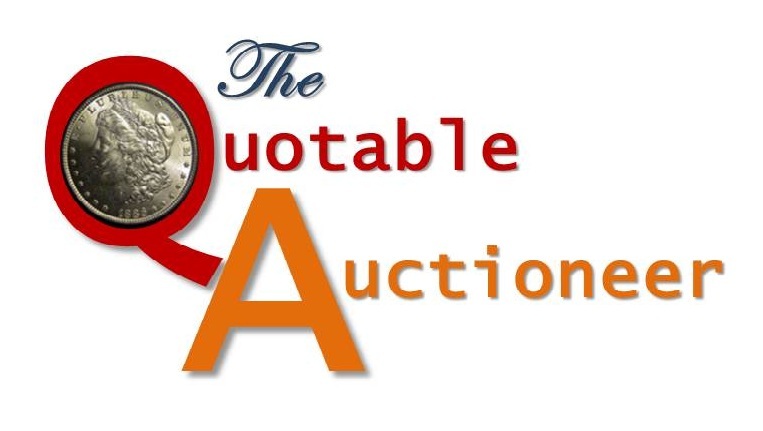 This entry was posted in The Quotable Auctioneer and tagged Liberty Shops Auction, Quotable Auctioneer, Sean Cook. Bookmark the permalink.